Manage data center change (Adds/Moves/Changes) with NetZoom™’s Visual Change Management to empower change management personnel and improve operational efficiency. All actions performed through Change Management generate an audit trail for the device for compliance and troubleshooting. The Change Management process begins when users initiate a change. Once a Change Request is issued, the process is driven by customizable workflows to completely automate the change management process and notify the parties to reduce the time to completion. The work order is built as the user interactively plans the changes. Out-of-the-box NetZoom integrates with ServiceNow and Remedy for change management service requests. Integration with other CMDBs and ticketing systems can be achieved easily with the NetZoom SDK and open schema. Authorized users can "Check Out" a data center node to perform a Quick Change without using the Change Management Approval process. Quick Change is usually utilized in response to an event that requires immediate attention. Is there enough capacity to support the next upcoming project? Use the Unplanned change to perform What If Analysis prior to initiating a change. Staging Mode can be used when populating a data center location or performing a large reorganization. 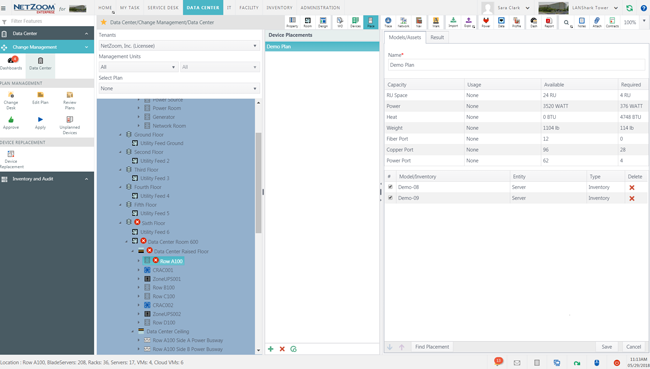 When in Staging, Authorized Users can freely edit the selected data center area, import asset inventory spreadsheets and receive an auto-generated work order. When it is time for a tech-refresh, use Device Replacement to locate and replace the devices that need to be refreshed with one click. The Placement Wizard helps users determine where new assets can be deployed. 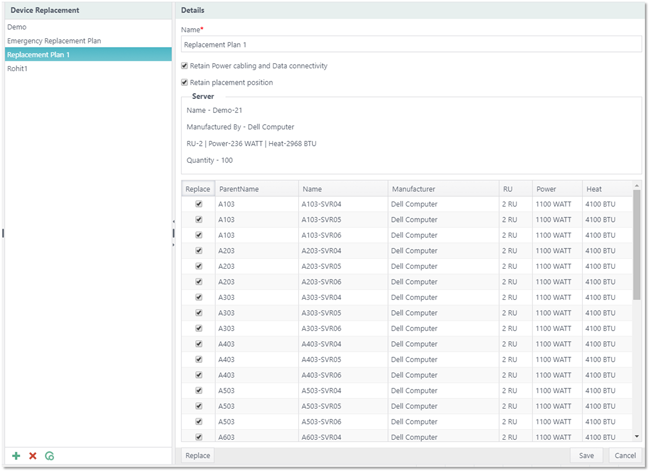 Create a device placement requirement based on rack units, power, heat, weight, and ports required to deploy one or more devices, and then use it to find all the racks with the available resources.